Where Can I Download Windows? - Ask Leo! Where Can I Download Windows? 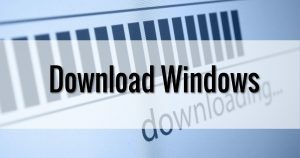 You can download Windows versions 7, 8.1, and 10 from legitimate sources. If you have a legal retail product key, this could be your replacement media. I’ve lost my Windows 7 installation disk, but I possess the product key. What should I do if I want to reinstall Windows on my computer? Can I download Windows somewhere? First: take a full system-image backup as soon as possible, and use that as a fallback. You can always restore to that image in lieu of a reinstall, and you’ll be back to where you were at the time the backup was taken. You could also get in touch with the vendor who sold you the computer. They provided you with a copy once; perhaps they’ll be willing to get you a replacement copy. You could, I suppose, go buy a new copy. Most people aren’t interested in doing that, because they don’t want to pay for something they feel they’ve already purchased. That’s when most people resort to finding a place from which to download Windows. Depending on the version of Windows and where you find it, it might even be legal. It’s been my understanding for years that downloading a copy of Windows from … well, from just about anywhere, was illegal. Even if you had a copy of a product key to activate it, simply downloading a copy of the software breaks copyright law. I believe that’s still true for versions prior to Windows 7. I know of no legal places to download Windows XP or Vista. Beginning with Windows 7, Microsoft actually made full ISOs of the operating system available for download. Legal issues aside, I will say this: in my opinion, downloading Windows is ethical if (and only if) you already have a valid, purchased, product key. So I must cover my assets and include this bottom-line caveat: if you elect to take this download from anywhere other than Microsoft itself, you assume all risk and potential liability relating to its legality. You can download Windows 7 SP1 from Microsoft here. That’s a link to the US-English download site – if you’re elsewhere you may need to search the Microsoft site for the download specific to your locale. You can download Windows 8.1 in ISO form directly from Microsoft here. Once again, that’s a link to the US-English download site. Once again, that’s a download of the US-English version directly from Microsoft. Even though Windows 10 may be automatically downloading on some machines, downloading the ISO is often the fastest, most reliable way to perform the upgrade or re-install. It’s big, really big. You’re looking at a download of several gigabytes for most Windows editions. Depending on your internet speed, that could be anywhere from an hour to several days’ worth of download. It’s an ISO file. For best results, you’ll want to then burn that ISO file to a DVD, which in turn should behave pretty much like an original installation DVD. It’s not OEM. These downloads are the generic, retail versions of Windows. If your machine came with a copy customized by your Original Equipment Manufacturer (OEM), then those customizations will not be present, and your product key may not work. Product-key issues aside, this typically means that after installing from this copy, you’ll need to get any missing applications and drivers from the computer manufacturer directly. Again, make sure you download the edition of Windows for which your product key was originally issued. That means matching the Windows version (7, 8.1, or 10), the edition (Home, Pro, Ultimate, etc. ), and possibly even bit-ness (32 or 64). If your product key is an OEM product key, as I said earlier, it may not work with the retail version download. There’s no legal way around this I’m aware of, other than to return to your computer manufacturer and ask for a replacement Windows disc, or purchase a retail Windows product key. You can, of course, download Windows without having a product key at all. You can purchase Windows as a direct download from Microsoft, and that will include a valid product key for your installation. All legit, legal, and malware free. Update 1/19/2016: Removed references to 3rd party downloads for Windows 7, and replace with a direct-from-Microsoft download link. Thanks to all who pointed out that this had been made available. Is It Illegal to Download Torrent Files? - Torrent files are used by bitTorrent file sharing and downloading technology. Are they illegal? No. But something else might be. I have been a TechNet subscriber for about 5 years. One thing I discovered about the ISO media that I have access to is that the Windows Vista and Windows 7 ISO media is compatible with OEM license keys. Multiple times, I have used TechNet media with OEM licenses. Even if the original OEM license is for Windows 7 Home Premium, it works with SP1 media. I use the TechNet media to provide my clients with assistance after malicious software infections have rendered the operating system unrepairable. After the 90-day Trial expires, if you wish to continue to use Windows 7 Enterprise, please note that you will be required to purchase and perform a clean installation of Windows 7, including drivers and applications. Whether or not you can use your existing product key from the beginning (or even use the “anytime upgrade” to enter your existing key) is not really clear, but the warning about needing to “perform a clean installation” afterwards doesn’t give me the warm-and-fuzzies. The Windows 7 ISO images hosted on Digital River is genuine and official version, and the downloads from the server is legal. It’s after all one of the official channel where end-users who purchase a license (product key) for Windows 7 get the setup installation files. Of course, the same caveats that you mention regarding OEM-customized versions still apply. Like most new computers, my Acer Aspire had stuff I did not want. I did keep an image of that, just in case. I downloaded every file I could from Acer, and then downloaded the Win 7 with SP 1 or 2 probably from Digital River. I did need the drivers from Acer, though. The product key I used was the one from my Family Pack (3) of installs. So not sure if the mfg key on the laptop would have worked. It is possible that Windows 8 & 10 have better driver coverage than Win 7 did. Windows 7 download site at Softpedia and the mirror you offer do not work, Leo. I lost mine in a move, and needed to do a rebuild, and called Dell. They sent me everything I needed – windows disk, driver disk, and other software disk free of charge. Never hurts to ask. They worse they can say is ‘no’. I was able to use the Softpedia links with no problem. Shelly should try again. on their ‘home made’ or sold restore disks. content, as a byproduct of the law suit. (1) Why won’t Microsoft let me download a copy of Windows to repair a PC where the hard disk has crashed? The PC has a sticker with a valid, legal key so whose copyright am I infringing? (2) What is the legal situation if I use my legal Windows CD/DVD to repair a friend’s PC, if he has a legal sticker etc etc? I can repeatedly install Windows on my legal, stickered PC (in fact I routinely reinstall Windows every couple of years just to maintain performance) and I re-activate without problems. I don’t want to do anything illegal, and I certainly won’t do anything unethical. 1) Not sure what you mean by “Microsoft won’t let me download …”, as some Windows versions are downloadable. But note: all Windows CDs/DVDs are the same, even XP; there no licensing info on them. If you have a valid ‘XP Home Retail’ Sticker, you can use any ‘XP Home Retail’ DVD that you can find or borrow to reinstall and use with your sticker on that PC. 2) Your CD/DVD is not the ‘legal’ bit; the sticker is the legal bit! You could lend your friend your DVD as long as he uses his legal sticker to rebuild his PC. 1. The Customer Support was from a place in “Southern India”!!! 2. The software has ACER “copyright”! I made a backup of the four DVDs at ‘the factory as built” and asked for again to be more sure to buy the original media for re-installation (in case my hard drive is for any reason damaged) and they mailed it at a cost of $19.99 plus taxes. These are important to have as they have the drivers for the keyboard, camera, speakers, DVD writer, built-in monitor..etc. All computer manufactureres now either include the “capability” to make media to restore the computer as it was originally built or at least allow to buy them at a reasonable price WITHOUT HAVING TO BUY AGAIN THE ORIGINAL WINDOWS INSTALLATION MEDIA (CD or DVD) as it will be included in their “Restore” media. I had the original Win 7 Professional factory CD. Over the years, it disappeared! I called M.$., and for $35 they sent me a new copy (with SP1). I had to verify the numbers off of the old installation, but I now have a disc for “repairs! I believe that Alt F10 is a machine specific solution. It’s not so strange that the software has an Acer copyright. Acer bough Gateway in 2007. As for the customer support coming from Southern India, I would be more surprised if it came from anywhere else. Why doesn’t MS allow you to download Windows? Now they do with Windows 7. Perhaps they thought it would slow down piracy. As for the legality of using a legal Windows CD/DVD to install on a friend’s PC if they have a legitimate key I don’t have installation media for Windows – what if I need it? Which product key do I use? The OEM one installed by HP or the one on the sticker affixed to the computer? Almost certainly, the sticker on your HP box *is* the product key provided by HP. Unless someone else loaded a different copy on your PC. Thru 8.1, manufacturers are required to affix the Product key sticker to the machine. On some laptops, it’s underneath the battery. i clicked on your link for a direct download from microsoft and the only thing they want you to download is win 10. there are no links to download anything else. they are really pushing 10. Today (6-Jan-2016) I’m seeing several problems on the Microsoft site, so I expect this may be a temporary, related issue. If you have a product key, Windows 7 can be downloaded directly from Microsoft, bypassing the need to use a very questionable site such as Softpedia. Ubuntu – free, no key, no illegalities, no hassle, hardly (if ever) attacked by viruses, … no problems. MS – Not Free, needs a key, needs virus scanner, lots of problems. My choice? UBUNTU. I haven’t even bothered to download a ‘free’ upgrade from my legal Windows 7 to Windows 10. I agree. Originally I tried Ubuntu, but found it more suited to touch-screens etc. For most of these people, I would suggest they moved to Zorin or Mint (both derivatives of Ubuntu). I have used Zorin for a few years, including updates to Zorin-9 Ultimate on my desktop, and Zorin-9 Lite on my laptop. You can download free versions without any hassles about registration or activation – why mess around with Microsoft? The layout is very similar to Windows, so it is easy to switch from Windows. The software choices are almost limitless. I can’t believe what people go through to keep Windows on their PCs. I clicked on the link you provided to mydigitallife.info but when I clicked the link to download Windows 7 Home Premium SP1 it just took me to http://www.microsofthup.com/hupuk/home.aspx?country_id=GB where I could see nothing about a Windows 7 download! Fortunately, I downloaded the X17-58997 iso from Digital River in May last year 🙂 But even though I have a full retail version of Windows 7 with a valid product key, I still cannot activate on my old computer because it had already been activated on my HP computer, which HP scrapped and replaced with a Windows 8 computer! And I find the thought of trying to phone Microsoft to explain this scenario, quite daunting :-/ Consequently, my old computer has been sitting unused in a cupboard ever since HP took away the computer on which Windows 7 was activated! I suppose it’s possible that it’s because you’re coming in from outside of the US? That’s my only thought. I tried it again and it got me to the right place. Another reader also posted this link: https://www.microsoft.com/en-us/software-download/windows7 – note that it’s local specific (en-us means US English). You may need to alter it for your own location, or simply search for Windows 7 download on Microsoft.com. I just confirmed what Leo suspected is causing the redirect to the Office 16 page. I had the same results as Sheri when I clicked on the link. Then I tried it using a VPN, and it went to the correct download page. This one is in Dutch, but maybe there is also an English version? Strange, after posting I find the link doesn’t work. none of these work any more. the link to mydigitallife takes you to a download for microsoft office pro plus 2016 and microsoft has removed all links to the win7 iso from digital river. this article is seriously obsolete and in need of cleaning up. correction, they’ve removed ALL windows iso links from digital river. I am thinking I need to buy a Microsoft 10 version for my Dell laptop. Dell (ex employer) let me keep my old laptop. And I have product key. However I can’t upgrade or anything since on Dell site shows I don’t own the laptop. So I partitioned it and loaded Linux Mint. Then wiped away the Windows 7. Hate Linux Mint. It’s terrible. So difficult to use command line if you are used to MS Dos command line. Also bought 128gig USB drive and Mint read write protected it. Apparently it’s a bug in Mint. So now that USB is worthless. So here is the question. Can I just go online and purchase a windows 10 OS, load it to a partition and then delete the Linux Mint? Sounds easy, but not sure. Assuming your hardware supports Windows 10 yes. You don’t even have to install it to a partition – just install it right over Mint, ,formating your entire hard disk as a single partition in the process. I TRIED TO DO A RESTORE ON MY LAP TOP , IN THE MIDDLE OF THE RESTORE THE COMPUTER STOPPED WPRKING .WHEN I POWERED OFF THE LAP TOP POWERED IT BACK UP ALL I GET IS A BLACK SCREEN . HOW MAY I RELOAD WIN 10 ON THIS MACHINE ? NOTHING WORKS CAN NOT GET TO ANYTHING ON THE MACHINE. ANY IDEAS WILL HELP! On another computer, download the appropriate version of Windows and burn it to DVD or create a bootable USB flash drive. On another computer, download and create a bootable Macrium Reflect or EaseUS Todo bootable rescue DVD or USB flash drive. Back up your computer using the bootable bootable rescue disk you created. Yes, you can actually perform a backup using the backup program from the bootable rescue media. Do a from scratch installation of Windows. Reinstall all your programs from the original installation media and/or files. Restore all of your personal files from the backup. You’ll likely need to burn the Windows 10 ISO to bootable media and then boot from that to reinstall or repair Windows.